Understanding the housing market is becoming more and more complex every day. While the national news reports point to general ups and downs, individual markets vary from those reports. Variations by region, by rural vs. suburban vs. urban, by production site-built vs. custom homes, and more result in a picture that is not accurately portrayed in a Tweet or news sound bite. Housing economists generally paint a positive picture for housing today as existing home sales are rising and new home starts continue to see some gains. The comparisons of existing vs. new home purchases raises some interesting questions as to how buyers are choosing. Is it availability, cost, or personal financials that is driving the decision? Financing a home purchase is not a simple task, and competent mortgage professionals are essential. From qualifying for a loan to validating appraisals to transitioning from a construction to permanent financing, their effort will be the difference from a happy or disappointing experience. The experienced lender can provide guidance during the appraisal process to determine if existing home “comparables” fairly represent the value of new construction. There have been many cases where a buyer chooses an existing home over building new because they can’t afford to add cash to get from the comparable to the construction loan value. New home construction has been touted as one of the best ways to improve our economy because new homes add jobs from forests to the building site. If the buyer can qualify to build the new home, will the appraisal come close? When comparing new homes built to high energy conservation measures are compared to existing homes, how does one evaluate the necessary renovations to make the two equal? There are efforts underway to include energy ratings to appraisals. The ratings give a benchmark rating like a mile-per-gallon or ENERGY STAR appliance rating and will eventually help equalize the appraised value. Still, the cost of materials and today’s minimum building/energy code requirements are a tough comparison to any house over 10 years old. For the broad housing market, affordability is taking on a new meaning. This relationship was discussed recently in Washington, D.C. when Lawrence Yun, chief economist of the National Association of Realtors, presented his midyear economic and housing forecast at the 2016 REALTORS® Legislative Meetings & Trade Expo. As shown in Figure 1, housing price growth exceeds the CPI inflation rate. As the price rises, more potential buyers fall out of the market despite the increasing demand for new housing. 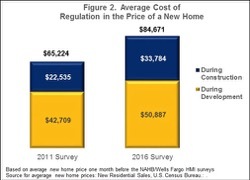 National Association of Home Builders (NAHB) economists analyzed 2016 data to 2011 cost data and identified a 29.8% increase in regulatorycosts since 2011. The increase in cost due to regulation brought significant impact to new home construction largely because of the availability of “affordable” building lots. 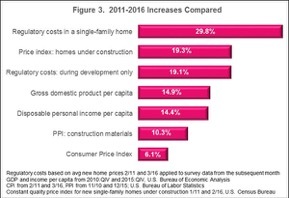 NAHB economist, Paul Emrath, Ph.D, reports that “regulations imposed by government at all levels account for 24.3 percent of the final price of a new single-family home built for sale.” The charts comparing the 2011 and 2016 surveys are most telling – the rate of construction cost increase is nearly twice the per capita gains over the same period. Statistical comparisons such as these paint a realistic picture of the market that prospective home buyers are entering. The impact comes through when looking at NAHB’s housing affordability pyramid which shows how home cost and household income define affordability. As regulatory costs increase at a rate higher than household incomes, buying and updating an existing home remains an affordable option in many parts of our country.